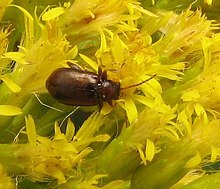 The Galerucinae are a large subfamily of the leaf beetles (Chrysomelidae), containing about 15,000 species in more than 1000 genera, of which about 500 genera and about 8000 species make up the flea beetle tribe Alticini. The division into tribes is more a matter of tradition than based on modern research. Some genera, for example Yingaresca, are better considered incertae sedis due to a general lack of knowledge. And while a good case can be made for some tribes – namely the Alticini and Galerucini – being all but monophyletic even in their traditional delimitation, others, such as Luperini, appear to be just paraphyletic assemblages of primitive and more basal genera. ^ Nadein, Konstantin S.; Perkovsky, Evgeny E. (2018). "A new tribe of Galerucinae leaf beetle (Insecta: Coleoptera: Chrysomelidae) from the Upper Cretaceous Taimyr amber". Cretaceous Research. 84. doi:10.1016/j.cretres.2017.10.023. ^ Bouchard, Patrice; Bousquet, Yves; Davies, Anthony E.; Alonso-Zarazaga, Miguel A.; et al. (2011). "Family-group names in Coleoptera (Insecta)" (88). doi:10.3897/zookeys.88.807. ISSN 1313-2989. ^ Nie, R-E; Bezděk, J.; Yang, X-K (2017). "How many genera and species of Galerucinae s. str. do we know? Updated statistics (Coleoptera, Chrysomelidae). In: Chaboo CS, Schmitt M (Eds) Research on Chrysomelidae". ZooKeys (720): 91–102. doi:10.3897/zookeys.720.13517. ISSN 1313-2989. ^ Nadein, K.S. (2013). "Catalogue of Alticini genera of the World (Coleoptera: Chrysomelidae)". Beetles and Coleopterists website. Zoological Institute, Saint-Petersburg. ^ Linzmeier, Adelita M.; Konstantinov, Alexander S. (2018). "Andersonoplatus, a new, remarkable leaf litter inhabiting genus of Monoplatina (Coleoptera, Chrysomelidae, Galerucinae, Alticini)". ZooKeys. 744. doi:10.3897/zookeys.744.22766. Wilcox, J.A. (1971-1975). Chrysomelidae. Galerucinae. Coleopterorum Catalogus Supplementa 78: 1-770. "Galerucinae". Integrated Taxonomic Information System. 16 February 2006. This page was last edited on 6 April 2019, at 18:03 (UTC).